The evenings are getting darker and to avoid a low mood I tend to treat myself with chocolate. And rum. In this case I combined them both! The recipe produces around 80 (70 in reality because of the..hmm.. “losses” during the process) pralines with a soft heart and a hard cover – just like my husband described me after tasting them! 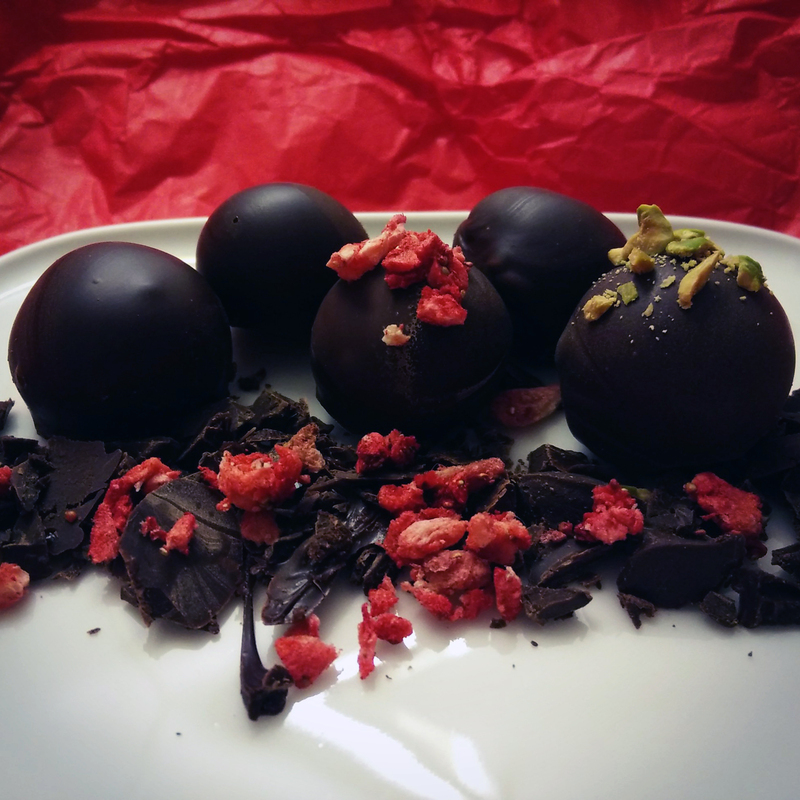 decorative stuff – ground nuts, pistachios, dried berries, white chocolate etc… Sky is the limit. First, turn all your chocolate into a proper pile of chocolate crumble. Divide the crumble in 2 cups: one should contain 340 grams and the rest should be left for later use. Heat the cream in a small pan until it starts to bubble. Pour the boiling cream on the smaller pile of crumble and start stirring from the middle. Keep on stirring and when you see that the chocolate starts forming a shiny ganache base, stir in the rest of the chocolate from the sides. When all the chocolate is molten in and the ganache base looks smooth and shiny, let it cool down for a while. (This phase is easy to do here, I just have to put the bowl on the balcony for a bit.) Meanwhile, whisk the butter with a wooden spoon until it gets fluffy. 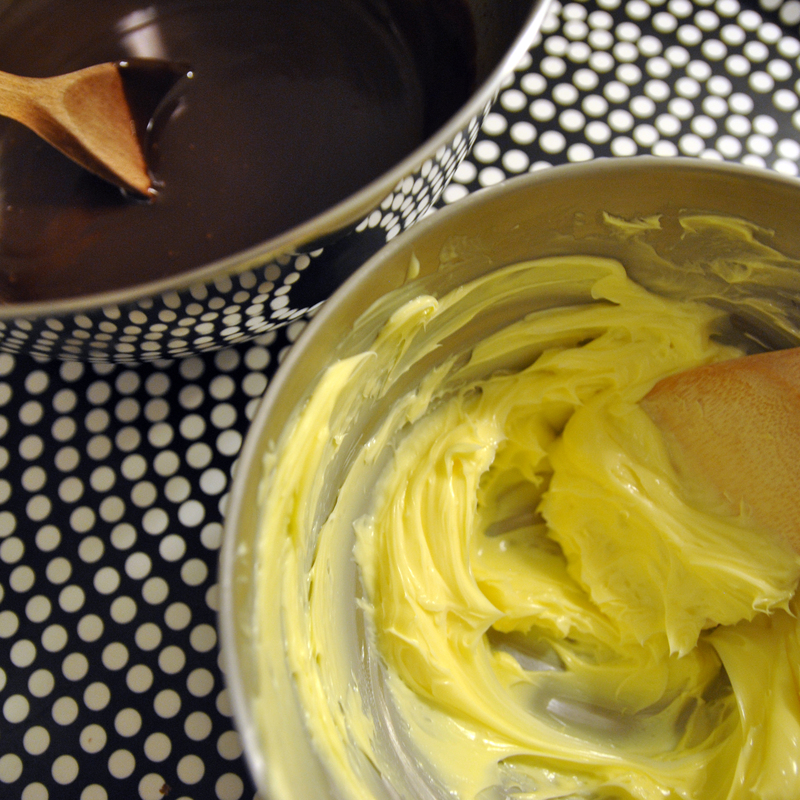 Mix the butter into the cool ganache base (the butter shouldn’t melt!) and stir the smooth ganache for a minute. Add the rum in small quantities stirring constantly until your ganache is glossy and smooth. You can make pralines with different kinds of filling by dividing the ganache and altering the type of liqueur you mix in. Let the ganache rest on the kitchen counter until the next day. Then, pipe the ganache onto a sheet of baking paper forming dropsof 1,5 cm’s in diameter. Refridgerate the drops for an hour, then roll them into balls between your palms. Refridgerate the praline hearts until you have tempered the chocolate. 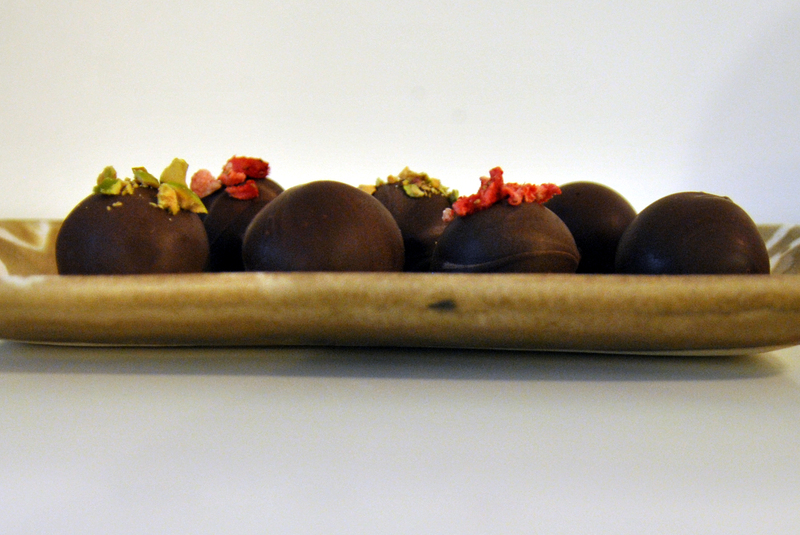 Dip the cool ganache balls into the tempered chocolate and roll the stick on top of the bowl of chocolate so that the extra chocolate drops back into the bowl. Move the balls carefully on a sheet of baking paper. If your tempering was successful the chocolate hardens very fast and in a couple of minutes you can safely move them around. Therefore all the crumbly decoration that you want to get attached to the chocolate coating have to be added right after you’ve placed each praline on the baking paper!